On April 3rd we aquaint ourselves with the metro and for 10 pesos ($1) we buy a return ticket. 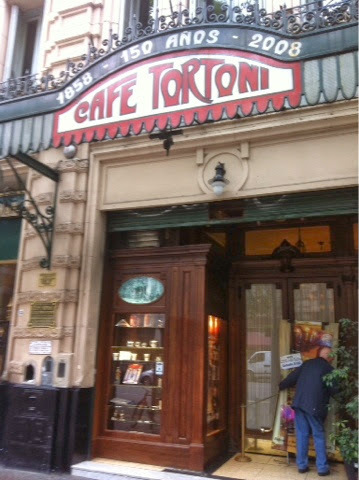 Getting off at the hub (Catedral) we walk around the Centro and first visit the oldest cafe in Buenos Aires, Cafe Tortoni built in 1858. 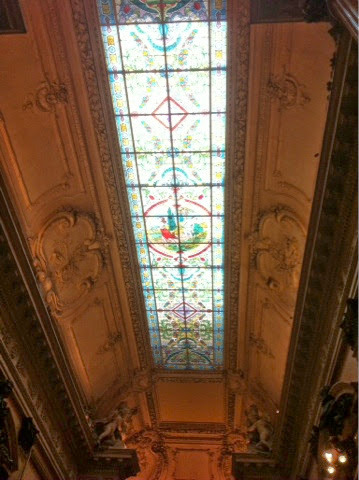 Beautiful building inside and out. 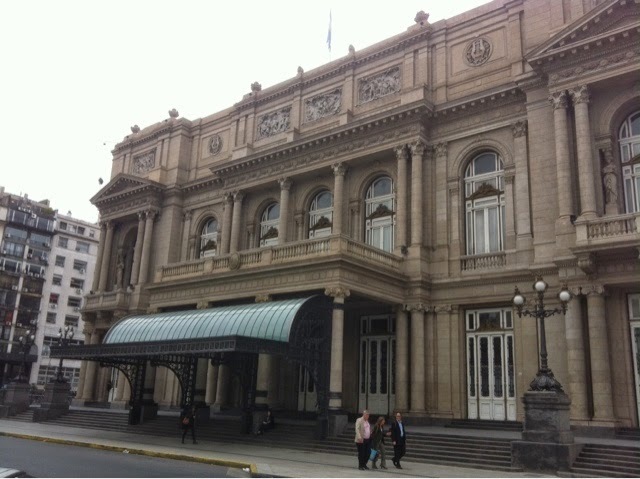 Then we find our way to the world famous Teatro Colon opera house. What a beautiful building. I would have loved to hear a performance but too late for tickets. 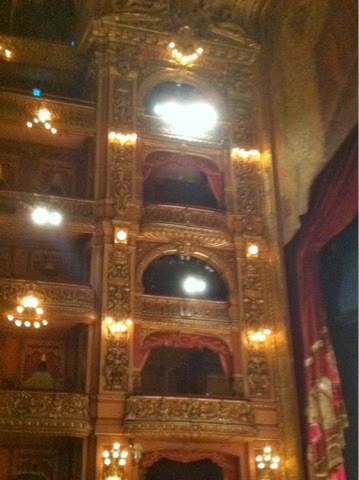 We do pay for a guided tour which was worth it and while we were listening to the guide we did hear the orchestra finishing up their afternoon performance. 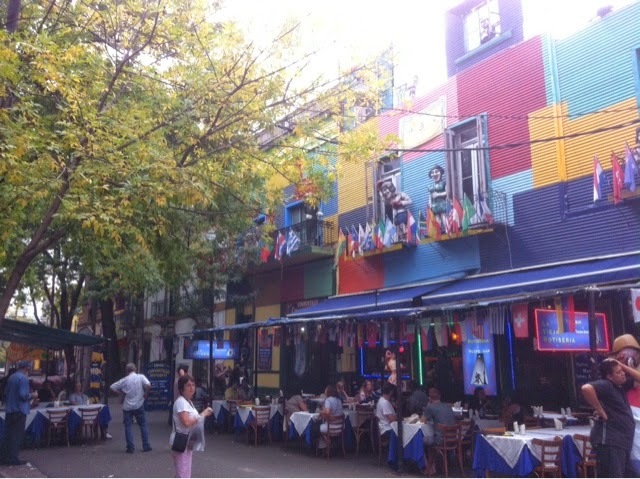 We then walk to San Telmo and have the best late lunch, early dinner at a steak house that I had found when I came to Buenos Aires back in December. Wonderful steak, salad and a HUGE glass of wine. The wine was 17 pesos which is $1.70 and so good. The whole lunch was approx. $16 each as the portions are so large that we easily share. What a steal. After this we catch a cab to travel to La Bocca. We had read the it is best to take cab in and out of this area due to high crime even during daylight hours. They say do not go there at all after dark! 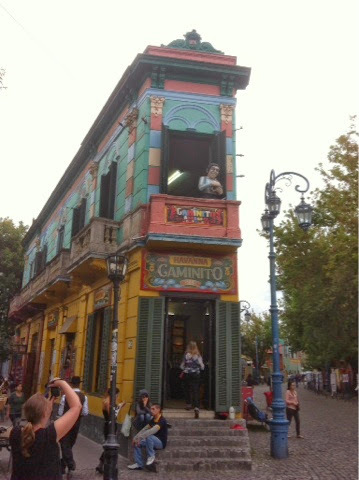 We arrive at the one area that is relatively safe and very touristy called Caminito. 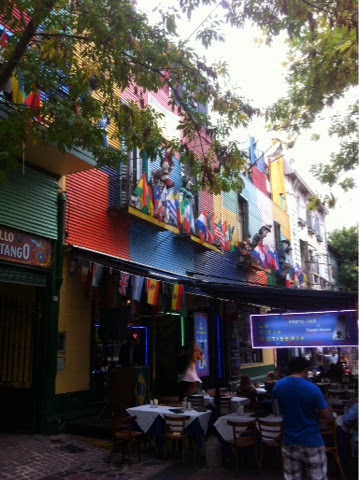 The colors are great and there are several couples randomly performing the Tango. I buy my token, tacky souvenir. 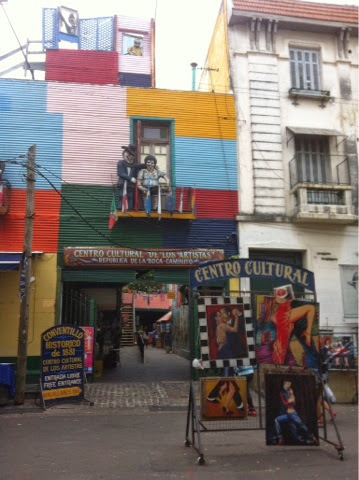 It's getting late in the day and things are closing up so we catch a cab back to the Centro to our metro station and go home. It's absolutely packed with commuters on the metro but moves quite quickly. We are still stuffed from our late lunch so no dinner tonight....just snacks and wine!